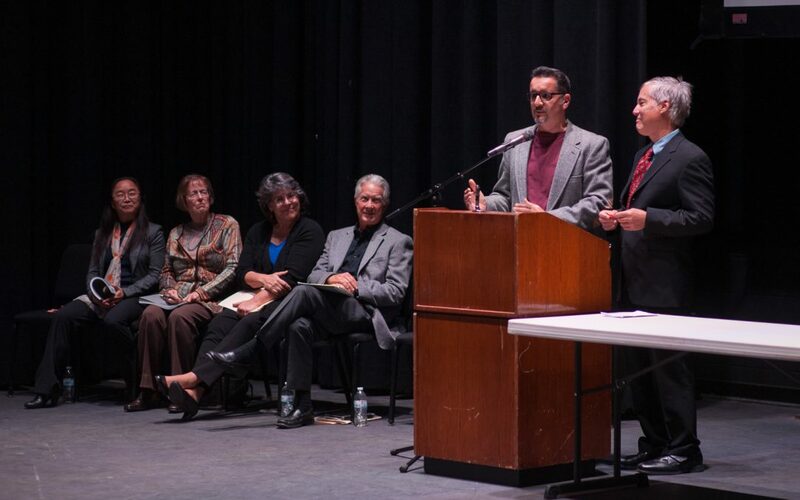 Rocco Versaci and Carlton Smith (pictured above, left and right, at microphone) expanded Bravura and brought the annual publication into the internet age. Now the 54-year-old magazine is getting two new faculty advisers. 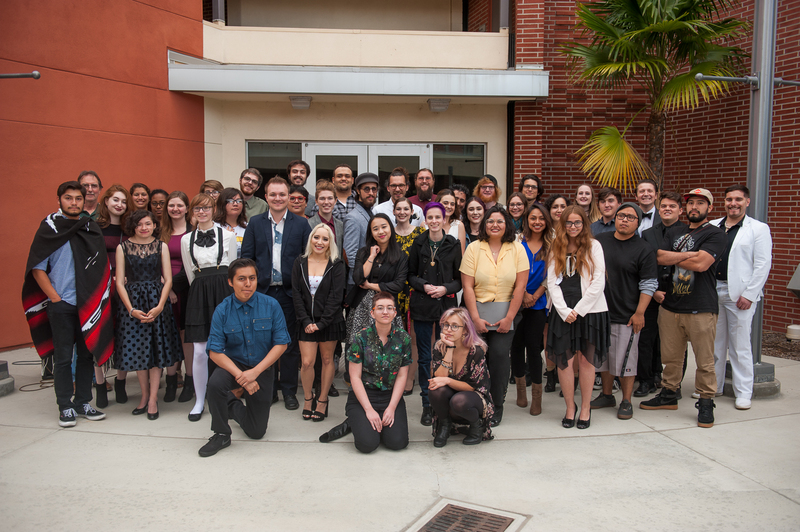 SAN MARCOS — For more than half a century, creative writers attending Palomar College have been publishing their work in Bravura, a literary journal designed and produced by students and overseen by a team of faculty from Palomar’s English department. 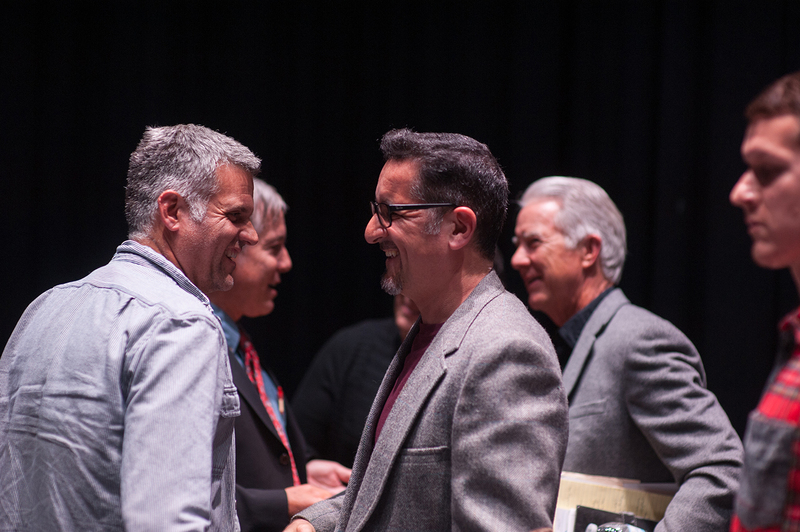 Since 2000, that team has consisted of Rocco Versaci and Carlton Smith, creative writing teachers who put Bravura online for the first time with their inaugural issue and made several other major changes while the journal was in their hands. Now the duo is handing the journal off to two younger faculty, Clare Rolens and Stacey Trujillo. The 2018 Bravura student production team. 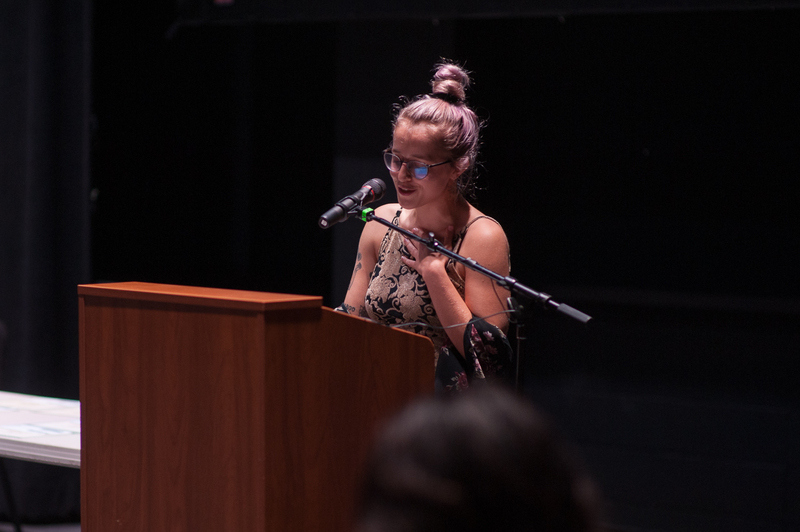 The idea of Bravura has always been to give young writers a taste of getting published, as well as to lead a dedicated class of students—ENG 137, offered every spring—through the production process. In 2004, Smith and Versaci added a gala and awards for the best prose, poetry and visual arts every year. 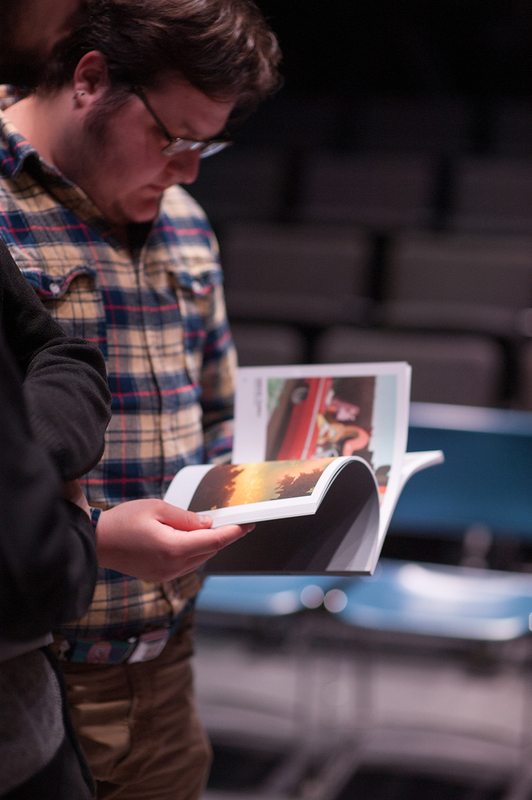 “Bravura definitely gives students a forum for their creative work,” said Versaci. “There’s a lot of artistry going on all over the campus, and Bravura is a place where students can show their work. “Also, the students who enroll in the course get the experience of working on a publication and learning all the ins and outs, working collaboratively,” he added. Rolens, one of the new Bravura faculty advisers, said she feels honored to be taking over a project with such a rich history at Palomar. A guest at the 2018 Bravura Gala reads the current issue of the journal. During Smith and Versaci’s tenure, Bravura won two national awards from the Community College Humanities Association, and Versaci remembered attending a conference in Chicago and sitting in a breakout session with other literary journal advisers. Rolens said she and Trujillo are spending the summer working on the strategy for their first issue of Bravura next year. Joelle Schumacher, winner of the 2018 Editors’ Choice Award for Poetry, reading her poem, “The Softening,” at the Bravura Gala. Students who would like to work on Bravura should enroll in ENG 137 in the spring, and students wishing to submit their creative writing, photography or artwork may do so by emailing bravurasubmissions@gmail.com. Submission information.